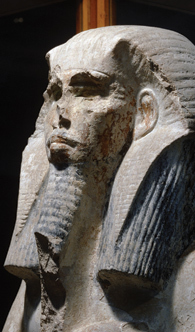 The first king of the 3rd Dynasty, Sanakhte (also given as Nebka) is little known, despite a reign of some 18 years. Presumably the foundation of the dynasty was cemented by marriage with the female heir of the last king of the 2nd Dynasty, the matrilineal nature of ancient Egyptian society being evident from very early times. Sanakhte is thought to be the brother of his famous successor Djoser (or Zoser), who became the second king of the dynasty and built the Step Pyramid at Saqqara. Both these kings began the exploitation in earnest of the mineral wealth of the Sinai peninsula, which was particularly rich in turquoise and copper. 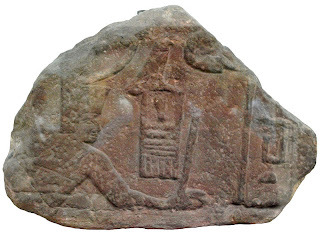 A fragment of a large red sandstone relief from the Wadi Maghara, Sinai, shows the figure of the king wearing the Red Crown of Lower Egypt and about to smite a foe - a posture that was already well established by this early dynasty. 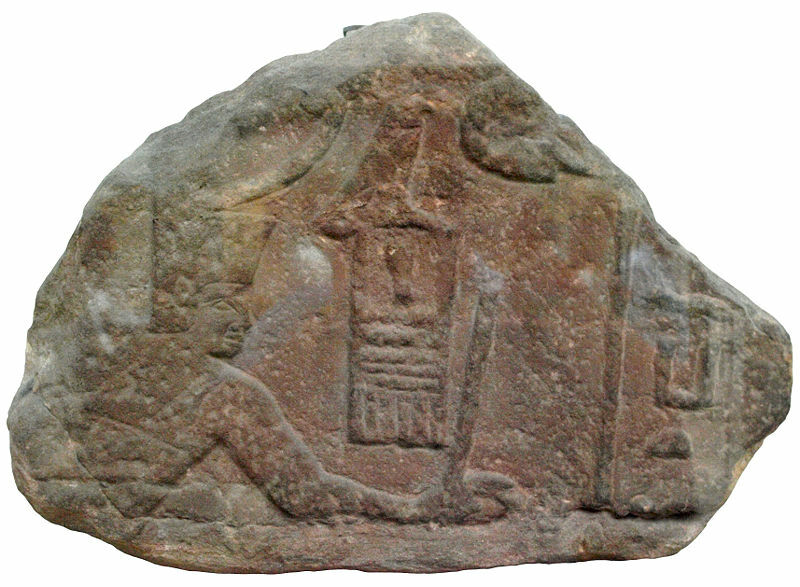 Relief fragment of pharaoh Sanakht, shown in the pose of smiting an enemy. On display at the British Museum. Both Sanakhte and Djoser, when he succeeded to the throne, apparently still had internal political problems to overcome. Djoser probably managed to extend his rule as far south as Aswan, the First Cataract, later the official southern boundary of Egypt. The name 'Djoser' in fact appears only in later records, and may have been his birth name. At the time he was known by his Floras name Netjerilchet, the name inscribed on all his monuments, including his Step Pyramid complex at Saqqara. While the two names are associated together at the Step Pyramid (New Kingdom graffiti there mention Djoser), the earliest proof that the names belong to the same king comes from a long inscription on a large rock on the island of Sehel at Aswan. The inscription is a Ptolemaic forgery cut by the priests of the god Khnum of Elephantine, and lays claim to some 85 miles (137 km) of territory south of Aswan known as the Dodekaschoinoi, 'in the god's name', it having been granted by Djoser. The priests of the goddess Isis on the nearby island of Philae, however, believed that Djoser had given the land to them. Both claims were probably untrue, but each side evidently considered that Djoser's promise had some ancient and lasting validity, endowing the king with substantial historical importance. The land grant was said to be in response to the local god Khnum terminating a seven-year-long drought, and associated famine. The tombs of officials from the previous dynasties had lined the edge of the plateau at Saqqara, looking out over the cultivation towards the royal capital of Memphis. Being low mastabas, they appeared only as a series of low mounds on the skyline. Djoser decided to move his monument back from the escarpment edge by about a mile (1.6 km), and there commenced a grandiose complex that was to be an architectural first: the famous Step Pyramid. Djoser's name and titles appear between the djed pillar and tyet amulet, followed by Imhotep's titles beginning 'The Treasurer of the King of Lower Egypt', on this broken-off statue base. Cairo Museum.